Clients often ask me why we require that all pools be permitted with the city and/or county. My typical answer is "Why not". That answer usually doesn't get me very far so I figured I would elaborate. Permit Costs are usually only a fraction of the cost of the job. 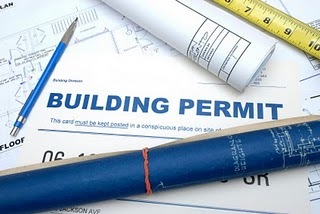 They typically are over the counter permits that require a simple plot plan, job plan, description etc. An average permit only takes 3-4 hours of work for an experienced pool removal contractor. Property value. If there is a discrepency of County records (ie. records say pool but there is not) the potential buyer may see this as a liability. The cost of permitting the work, if required, would be a concern. Tax benefits. I have been told by clients that they have petitioned the county to lower their taxes based on the reduced "value" of their home without a pool. I have not verified the validity of this so check for yourself. Having another set of eyes "AKA Building Inspector" visit your jobsite verifies that the pool removal process is done to the satisfaction of local requirements and keeps your contractor on track as well. The cost of going back and permitting and unpermitted pool will far exceed the oringinal cost. Most cities will require a plot plan for the permit which will show the location of the former pool. This will be very important if you ever decide to build near or over the site. Neighbors! If anything will invoke the inner tattle tale of your friendly neighbors it will be the jackhammering, trucks, equipment, etc. used to accomplish your job. There is nothing worse than trying to obtain a permit after recieving a stop order from an angry building inspector. The only advantage to not obtaining a permit is to save $100-$500 in permit cost . In terms of Risk / Reward I feel there is no question here. Hence my "Why not" statement. If your contractor tries to talk you out of getting a permit or tells you to take care of the permit I would suggest finding another contractor. An experienced pool removal contractor can handle everything for you in far less time than if you do it yourself. Many of my customers have decided to defer maintenance on their swimming pool and drain it in the mean time. The often unforeseen consequence is that a swimming pool with no water can also be a boat. 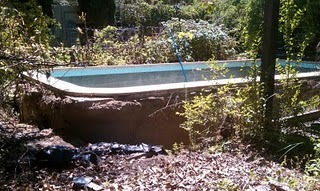 As the water table rises during the rainy season or water seeps in from the sides, the pool can lift out of the ground. I have seen them as little as 6" to as much as 5 feet out of the ground. If the plan was to remodel the pool, it will now have to be removed completely, back filled and then re-dug in the shape of the new pool. A BIG mistake. Alternately, if your plan had been to remove the swimming pool using the partial removal technique it changes the process significantly and would include an increase in price. On the flip side, if you had planned on a full removal it makes no difference exept that we may need to wait a few days in between demolition and backfill to allow the cavity to dry. It actually surprised me that so much water was still under this pool because it was late July but due to the clay type soil in the area it held the water for months. Break 2 holes. One in the deep end and one in the shallow end. The holes should be broken at least 2 ft. X 2 ft. Do not cut the holes with a concrete saw because you will cut the rebar and the repair will be more difficult. Use a small jack hammer and break small bits of concrete and remove all of the rubble leaving dirt and rebar exposed. BEWARE: Do not drain your pool completely all at once during the rainy season. It is best to drain it until the shallow end is exposed. Break your first hole in the shallow end. Then drain the rest and break the hole in the deep end. 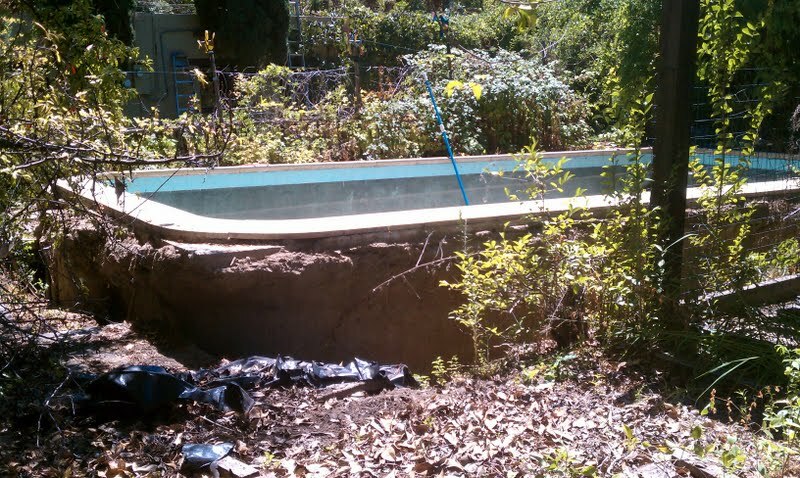 This process does not guarantee that your pool will not move but will reduce the likelyhood. Swimming Pools are designed to hold water and that is what is best for them. If at all possible do not drain your pool until you are ready to act on your remodel or removal. If you have any questions regarding your swimming pool removal or draining feel free to call me. Family makes subterranian garden from swimming pool. This is the starting point for most of my customers. The pool is 30 years old and something must be done. But what? Can you justify the cost of remodel with the frequency in which you use your pool? Is keeping the pool going to help the value of your home? 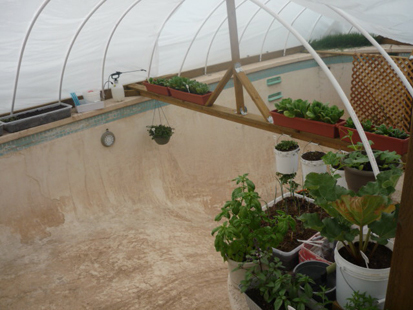 Perhaps you have always dreamed about having a backyard garden full of tomatoes and squash and the only space is right over the old swimming pool. Over the years, I have seen hundreds of homeowners in this dilemma and have seen them go both ways including one incident when a client went with a remodel and then called me back three years later to remove the remodeled swimming pool! If you are in this situation and need some advice please give me a call. 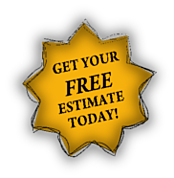 I can come by and give you a no cost estimate as well as refer you to a remodeling contractor.